The origin of the Maas family name is not known for sure but it is unlikely that it existed much before the 13th century. Prior to recorded history, there was very little need to be known by more than one given name. People lived in small villages or communities and everyone knew their neighbors. If more than one person shared the same name, they only needed to be distinguished by age, personal characteristics, occupation, or location, e.g. Karl the younger, Erich the red, Otto the miller, or Heinrich from Buchholz. As population increased through the centuries, it became increasingly necessary to adopt surnames. The first to acquire surnames may have been the Chinese when Emperor Fushi (Fu Xi) decreed in about 2852 BC that people would be identified with a formal family name as well as with a familiar first name. Surprisingly, surnames didn't appear in Europe until about 2500 years later when the Romans began using clan names in addition to a given name. Later the aristocratic Romans adopted a naming convention that included a given name and two surnames, i.e. a clan name plus a family name that was inherited from father to son, serving to distinguish members of a family within a clan; e.g. Gaius Julius Caesar. These surnames had an hereditary basis, but were not strictly family names as we know them. Furthermore, the master's surnames were given to freed slaves; and as foreigners became new citizens, they often adopted the names of their sponsors. With time, this naming system became increasingly complex with the addition of fourth and fifth names, e.g. Gaius Julius Caesar Augustus Octavianus, the great-nephew of Julius Caesar. By the end of the Roman Empire in 476 AD, hereditary surnames had essentially vanished and single names became the norm throughout much of the Dark Ages. Hereditary surnames weren't adopted again in Europe until about the end of the first millennium when it was reinstituted once again in Italy by the Venetian aristocracy. During the Crusades, the custom spread throughout Western Europe with noble Norman families being the first to adopt surnames. The first extensive use of surnames appeared in the Domesday Book, which was compiled in 1086 by William the Conqueror to document all the property owners in England. However, these surnames were not truly hereditary but rather patronymic and locality names. It wasn't until the end of the 13th century that hereditary names became commonplace. The first documented Maass living in the coastal area where my 4th-great grandfather was from was Martin Maass who was born about 1540.1 He was a full farmer on a farmstead he inherited from his father at Boltenhagen on the outskirts of Henkenhagen in Kr. Kolberg-Körlin. The Germans who migrated into this area came mostly between 1260 and 1360. They introduced new ways of farming and building construction, and, of course, they had their own language and governing laws. Based on 1) the Saxon-type of house construction (where the house and barn shared the same roof), 2) the allocation of the field boundaries in Hägerhufen (ca. 100-acre farms), 3) the Friesian's way of stabling the cattle, 4) the Luebeck laws and town charters and 5) the low German dialect, Carl Maaß1 concluded that the German colonists who settled the land around Kolberg belonged to branches from Lower Saxony and Frisia. Therefore, it seems likely that our Maass ancestors originated in northwestern Germany, perhaps somewhere near the Maas River, which flows through the Netherlands near the border of Germany. More on this in an article I wrote and published in the Fall 2011 issue of Die Pommerschen Leute entitled, "Origin of our Baltic Coast Ancestors". We may never know when the first Maass arrived in the Kolberg area, but I am hopeful that in an archive somewhere, we may learn which Maass obtained the farmstead, and whether he obtained the land directly from the church or from someone else at a later date. Thanks to Manfred Vollack's book about Kolberg county,2 we do have a little history about the Maass farm. 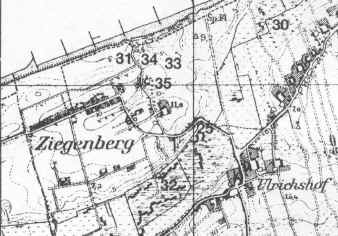 The farmstead, site #2 in the upper left corner of the map above (see arrow), actually lies closer to Ziegenberg than to Ulrichshof. At one time the farm was jokingly referred to as Wolfskuhle (wolf pit or trap). About the beginning of the 17th century, Peter Maass, a Henkenhagen farmer and wolf hunter, set traps here to catch wolves, so this area got the nickname, Wolfskuhle. The proximity of the two sites can be seen on the following topographic map (Click on map to enlarge). The Wolfskuhle, designated by the number 35, lies just to the left of the number and the farm buildings are located just below the number. Around 1717, a Christian Maass went before the Kolberg magistrate to request permission to farm the area also variously known as Knisterberg (#34) or Butterberg. Over the next ten years there was an extended exchange of letters from Christian requesting the right to pass the land to his heirs, something the city treasurer refused to grant. Christian Maass countered with evidence that his family had lived there for more than 100 years. Finally, he was successful and named an hereditary farmer. Now, for the first time, he passed the farmstead to his minor son, Gottfried, for whom his son-in-law, Johann Maass of Ulrichshof took charge. Of course, after more than 200 years of Maass descendants, there were many Maass families in the area and some had spread out into surrounding villages and towns. By 1780, there were 5 Maass families farming in Ziegenberg and Henkenhagen alone.2 Pagel Maass, my 4th-great grandfather, was living at that time in nearby Lassehne, which is about 2 miles east of Henkenhagen. His son, Christian, who was born there in 1781, eventually left the area and moved about 35 to 40 miles southwest to the county of Regenwalde where my 2nd-great grandfather, David, was born. However, the Maass surname continued to predominate in the area. In 1937, it was the second most prevalent name in Henkenhagen with 23 adult Maass inhabitants living in 16 households.2 As families multiplied, land holdings were often split. 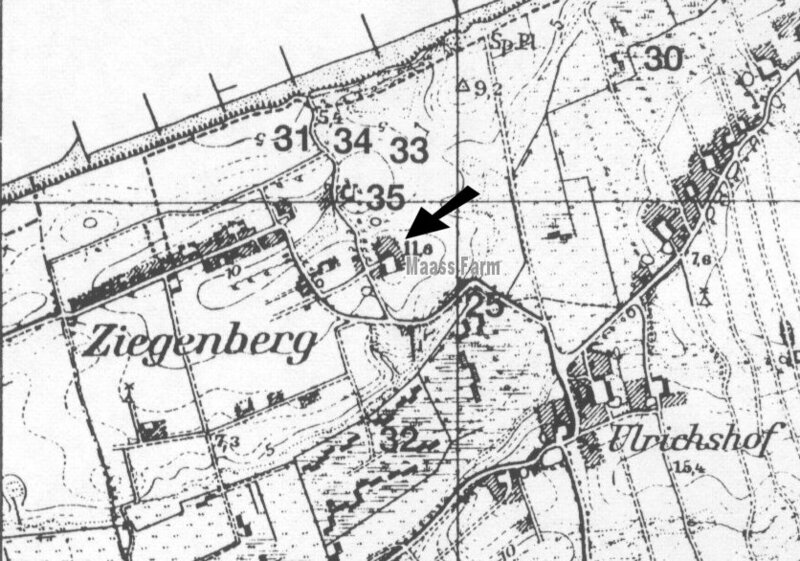 Vollack2 reports that in 1939, the Ziegenberg farm was only 26 ha. (64 acres) in size. 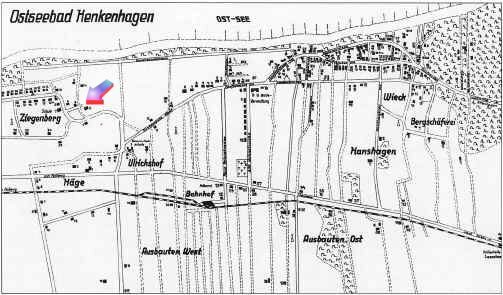 However, there were two other Maass farmers with similar holdings nearby, Fritz Maass with 69 acres in Ausbauten West and Wilhelm Maass with 64 acres in the Bergschaeferei (shown on the Henkenhagen map above). Only one other farmer had more land, August Steinkrauss who had 106 acres. Clearly, Maasses were early settlers in Henkenhagen and apparently were prominent too. According to sources cited by Vollack2, a Maass was the first teacher in a school founded in Henkenhagen around 1775. The school was a recipient of a set of Krünitz's Encyclopedia given by Mrs. Dorothy Maass. It should be noted that this 16-volume encyclopedia, which was published in 1771, was a highly regarded reference that would have been very valuable at the time. That Dorothy Maass could make such a generous gift speaks to her position and suggests that she must have been fairly well to do. Vollack also goes on to say that the position of mayor/sheriff had never been established officially in Henkenhagen, so in the meantime, the duties of mayor/sheriff seem to have been carried out by members of the Maass family (this was in 1858). The last Maass occupant of the original farmstead in Ziegenberg was Emil Maass. In 1932, he retired and turned the farmstead over to his son, Reinhard. Unfortunately, Reinhard, like his brother Artur, fell on the eastern front in World War II. Then, when all Germans were expelled from Hinter Pomerania after the war, Emil Maass was forced to leave his farm. In 1946, he fled to the west and settled in Büdesdorf near Rendsburg in West Germany. Emil also had a daughter named Margarete Meta Mathilde who was born in Ziegenberg in 1910, but nothing is known about her. The farm that had remained in the Maass family for over 400 years -- as well as all the land east of the Oder River -- was then occupied by Poles, many of whom had been displaced from their own homes in eastern Poland by Russia. The farm as it appeared in April 2007 can be seen by clicking on Maass Farm photos. 1 Maaß, Carl 1963. Deutsches Geschlechterbuch Band 134: 381-478. Fünfter Ostfriesenband Genealogisches Handbuch bürgerlicher Familien. Herausgeber: Regierungs-Vizepräsident a. D. Dr. jur. Edmund Sturtz. Verlag von C.A. Starke /Limburg an der Lahn. 2 Vollack, Manfred 1999. Das Kolberger Land. Seine Städte und Dörfer. Ein pommersches Heimatbuch. p. 280-304. [The Kolberg LandBook]. World Book Encyclopedia, 1978 Vol. 14, p.5 Name, Personal & p. 353 Norman Conquest. World Book Encyclopedia, 1978 Vol. 5, p. 247 Domesday Book.